March" from "Saul," their bands were intoning the massive strains of Mendelssohn's "Antigone" and a movement from Spohr's " Power of Sound." These men, at any rate, had no tastes for "ephemeral pro�ductions." During the early years of the Crystal Palace, grand concerts were given there by our staff bands. In those days, band concerts were in their infancy, and it was common to hear people say at the Palace: " There is no concert to-day, but the band is going to play !" The first occasion of a military band going on a concert tour was in April, 1855, when the Royal Artil�lery band gave a series of high-class concerts in the north of England. This band was universally con�sidered the finest in England at this period. In 1857 it was augmented from forty to eighty performers, and again in 1887 to ninety-three�the largest band in the service, which it has since remained. 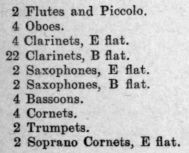 Here is the instrumentation of the Royal Artillery band during the reorganisation, together with other bands of the period. ROYAL ARTILLERY BAND. 106th REGIMENT BAND.